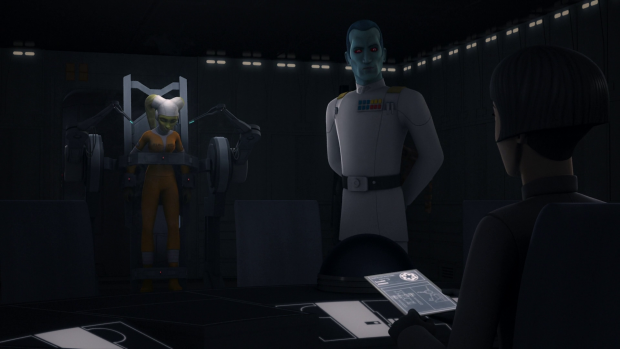 Star Wars Rebels picks up from the previous episode after Hera’s capture and Kanan’s single minded desire to save her. There are so few episodes of this show left that it makes sense to focus on the characters and the relationships they share with one another. Hera and Kanan’s relationship has been vaguely defined yet compelling in its own right since the first episode so any focus on their connection is a welcome one. I criticised the previous episode for failing to address that Kanan’s personal feelings might cause him to lack objectivity where the bigger picture is concerned. This episode confirms this failing while addressing it in a small way when Kanan asks Ezra to take the lead on rescuing Hera. He isn’t able to think clearly because of his personal feelings so turns over the mission to someone that he trusts. There is no mention of the overall objective which is problematic as Kanan’s personal mission is very much getting in the way without anyone challenging him on it. Despite the plotting issues this episode definitely excels from a characterisation point of view. Kanan’s determination to save the woman he loves provides an excellent emotional core and the stakes for Kanan are nicely laid out. Hera being tortured is brutal enough without being too over the top for a children’s cartoon and there’s an impressive sense of danger throughout. Broadly speaking this is another heist episode as the Ghost crew need to sneak into another Imperial stronghold to retrieve something. 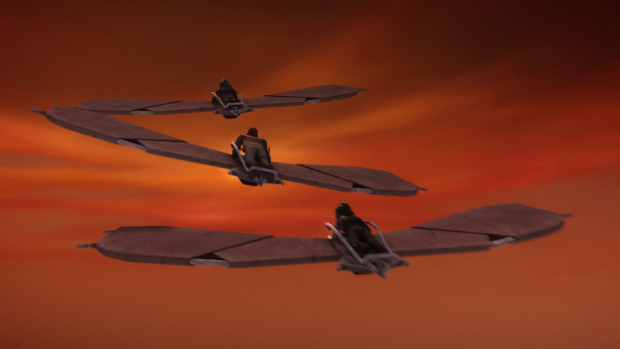 This is handled really creatively with the construction of makeshift gliders to grant them entry while evading detection. I liked how this was handled especially with Zeb’s reluctance to try this considering just how rudimentary they were. It’s a solid moment of levity in a weighty episode and allows Zeb a fun moment. Vanessa Marshall has a difficult acting challenge in this episode as she has to portray Hera softened by her torture without changing her completely. The results make for an intriguing alteration to the character in a way that works wonderfully. Her hardened exterior disappears and she becomes much more vulnerable. It’s clear that the torture is the cause of this and it isn’t her natural personality but it also creates an excuse for her feelings to be explored in ways they otherwise wouldn’t be. Her reunion with Kanan is a clear example of this as she is almost giddy with excitement while pointing out that she hates his hair cut. She also becomes more nostalgic in referencing the time they first met showing the effect the torture has on her. Interestingly that’s all the torture does to her. A combination of pain and a truth serum means that she’s close to giving up information on the Rebellion but before that happens she becomes open about her feelings which suggests a conscious effort to resist dooming the Rebel Alliance by divulging personal information irrelevant to the Empire. It’s a clever tactic showing how strong willed Hera is while also furthering the notion that she buries her feelings deeply. The reunion with Kanan is great because she is uncharacteristically affectionate which is returned by Kanan who has been bursting to let her know how he feels since being worried that he lost her. Naturally he does so though Hera can’t find the words despite the drug induced emotional awakening she has experienced. I’m not a fan of artificially creating ways for characters to open up about their feelings as it feels cheap and unnecessary where having the character open up naturally would be far more effective and develop them in a more meaningful way. Hera’s eventual admission of her feelings for Kanan does work to a large extent but it has that undercurrent of being false thanks to what Hera has endured to get to that point. This is an example of the situation itself making the moment more effective as the stakes are high and the characters are faced with a life threatening situation making it possible that there will never be another chance to say those things. It’s almost Shakespearean in the scope of the moment and the visuals compliment it wonderfully. It’s a powerful parting between two characters who have a rich and complex relationship that they both struggled to define because of their commitment to a larger cause than just themselves. In Kanan’s case he was part of the Rebellion, a student of the Jedi arts and a mentor to Ezra. It’s easy to see why his relationship with Hera might slip down the priority list. 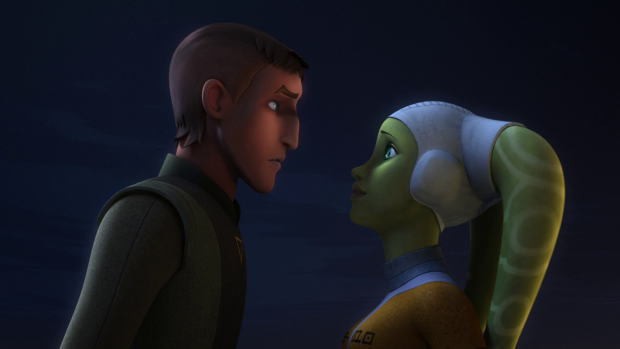 Hera’s commitment to the Rebellion means that she understands that and has a good idea of her own priorities. Kanan’s sacrifice is meaningful for that reason. This is a moment where his commitments match up and he gives his life to save those he cares about. This compliments every aspect of his personality as he is saving the Rebellion, his student and the woman he loves all in one fell swoop. The emotion of his sacrifice is brilliantly played by all concerned and the tragedy is given the weight it deserves. I fully expect that Kanan will return as a force ghost in the coming episodes but the loss of this character carries a lot of potential such as leaving Ezra without a master with the potential to succumb to the Dark Side, affecting the Ghost crew on a very primal level since they have lost one of their own and Hera will have to deal with losing the man she loves. There’s a lot of emotion flying around the show after this so it will be interesting to see this dealt with. A great episode that delivers excellent character moments and a meaningful sacrifice for Kanan. 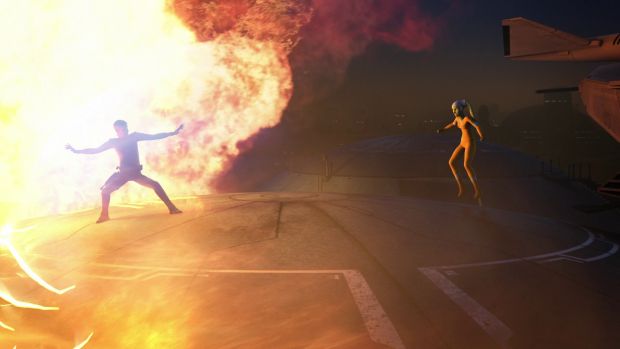 Using this as a showcase for Hera and Kanan’s relationship was a really good idea even if the mechanism of having Hera drugged up to make it happen was problematic. The emotional connection is no less real and addressing how complex their relationship is becomes very important. Vanessa Marshall excels in her performance here and the sacrificial moment has the weight that it needs. Moments for the other characters are limited though there is some levity when Zeb is reluctant to use the makeshift gliders. There is also a hint of the master/student relationship that Kanan and Ezra share to remind audiences of how important this will become now that Kanan is no longer around.